HomeGuard is an advanced parental control and activity monitoring tool for family and child safety online and offline. Once installed HomeGuard will silently and automatically block all adult and inappropriate content online and record detailed website activity including time of visit and time spent on each website. Plus a built in keylogger, activity based screenshots, chat and email monitoring and filtering, program/games blocking and time restrictions, Internet and computer usage time restrictions, email notifications and more. HomeGuard is virtually impossible to tamper with, it cannot be bypassed using proxy servers and is unclosable and uninstallable unless the administrative password (provided during installation) is used. 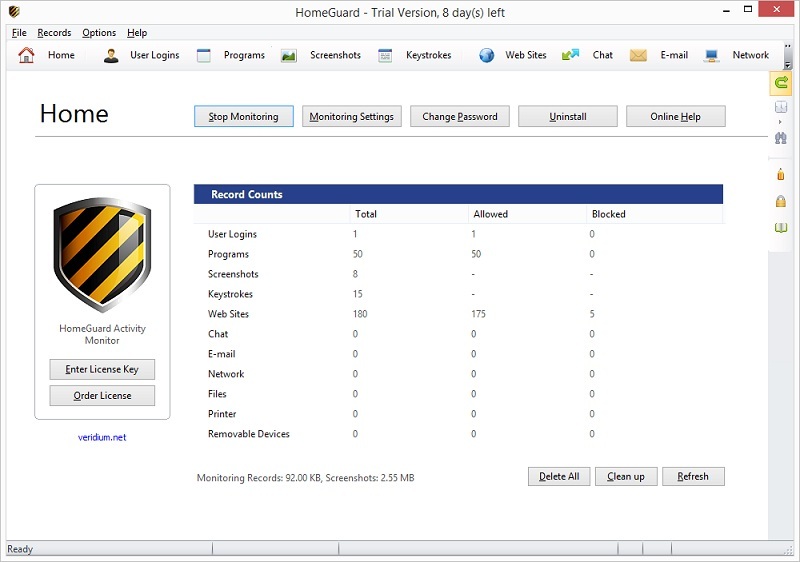 Veridium Software today announced the release of version 1.8.1 of HomeGuard Activity Monitor, its popular shareware parental control software. This demo version can be freely distributed through the Internet. END-USER LICENSE AGREEMENT FOR HomeGuard Activity Monitor IMPORTANT PLEASE READ THE TERMS AND CONDITIONS OF THIS LICENSE AGREEMENT CAREFULLY BEFORE CONTINUING WITH THIS PROGRAM INSTALL: Veridium Software's End-User License Agreement ("EULA") is a legal agreement between you (either an individual or a single entity) and Veridium Software.